Since I was invited by Gareson to contribute to this blog its time to start contributing. 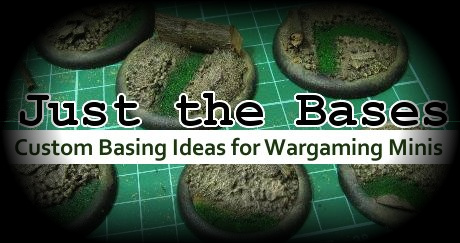 For the beginning, a repost from my blog about Forest rock bases. The base was sculpted from standard grade milliput. All texture was made with crumpled-up aluminum foil. While milliput was still soft I pinned Baldur's feet, and inserted him into the base to mark his footing. The next step was ti give the whole rock a liberal wash of light sepia (ogryn flesh equivalent). I just used a home-made wash. Main reason for light sepia wash is that no real rock is monochrome and it just makes it look a lot better. And for the very end here is the recipe for the home-made-wash I use. This recipe is floating around the interwebs, and I dont take any credit for it. 3. Add waterproof acrylic ink to your liking. For 10ml of the mix I like to add 50 drops of ink.